Hello all! It's yet another rainy yucky day today. Good thing we have a play date planned! I go crazy if we have to be cooped up inside all day. Here's a card I made for a couple challenges. I took the colors from The Play Date Cafe and then combined it with the Flutter By Challenge. However, I'm late for the Flutter By challenge! :( It was an open challenge where you just had to use a butterfly, fairy or angel. This is a fairly quick card. The black paper with flowers is from DCWV. I just added the little butterflies which I made orange with some ink and then added Stickles to. The ribbon is actually have a flower arranging place, there's no brand on it. The stamp is from Ippity's Regal Greetings. And the stick pin is Dritz, from the sewing section of the craft store. This is just stunning! Love how you added that bright butterfly just to pop with the color. Very pretty! I love the dramatic colors! And I love that it is largely DP that is giving it it's pattern! Beautiful girl! Love this!! So striking! You can still enter it this week...the main challenge is always just to have a butterfly, fairy or angel on your creation!! This is so pretty Ashley!! This is gorgeous, Ashley! The black background makes this stunning.. Thanks for playing with the PDCC!! 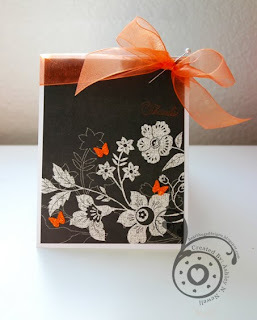 I love this paper and your card pops with the butterflys & ribbon. If you'd like to see how I used it, check-out my blog. It's the 3rd or 4th post down (depending when you read your comments). I gotta admit, I like yours more.